A play about a young cowherd boy named Wang ErXiao, who was killed while fighting Japanese invaders, will be staged this Wednesday in the Huairou Theatre in Beijing. The play Red Tassel, or Hong Ying in Chinese, will mark the end of China Children's Theatre Festival, which will have lasted for more than one month. 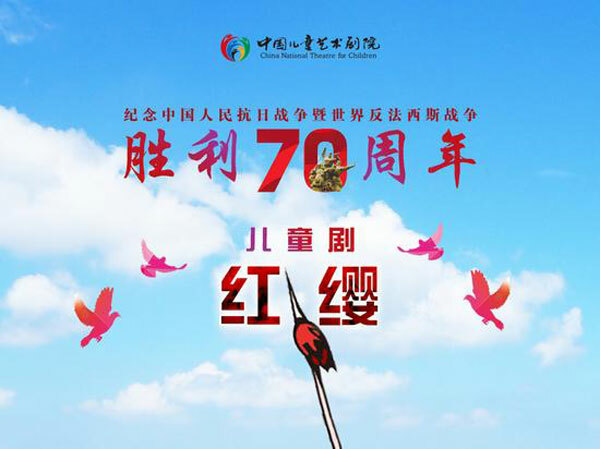 Meanwhile, it also commemorates the 70th anniversary of the Chinese People's War against Japanese Aggression and the World Anti-Fascist War Victory. Du Wei is the script writer of Red Tassel. She said she was inspired by a Chinese song called "Sing for the Cowherd Boy-Wang ErXiao". "The song dedicated to the cowherd Wang Er'xiao is quite familiar to Chinese people, and I feel deeply moved each time I hear it. The song was published on The Shanxi-Chahar-Hebei Daily in 1942, and its earliest singers have aged now. Nevertheless, the image of Wang ErXiao, who always held a red-tasseled spear, has been deeply engraved in our memories. Inspired by the song, our production team put the story of this young hero up on the stage to commemorate a great number of those youngsters who had sacrificed their lives in China's wars against invaders." Red Tassel is based on a true story. During the war, a boy called Wang Erxiao longed to join the army to combat Japanese invaders, as both his parents were killed by the Japanese. However, he was too young to enlist, so he became a child League Member, who was responsible for delivering newspapers at an important anti-Japanese military base. The Shanxi-Chahar-Hebei Daily office was then located in a small village in the military base where Wang Er'xiao had lived. During a so-called mop-up operation launched by the Japanese, Wang sacrificed his young life bravely in an attempt to protect the newspaper's office. Ma Yanwei, director of the play, thinks although many people are aware that The Shanxi-Chahar-Hebei Daily has once published a song praising Wang Er'xiao, few of them are clear about the young hero's relationship with the newspaper, which offers a new angle for this adapted children's drama. "Er'xiao had sacrificed his life while protecting the newspaper's office, and the office in turn published a song in memory of its protector, which endows the play with new meanings. Exploring the story related to the newspaper is also very essential to the whole play. At the beginning, Er'xiao is an orphan who wishes to avenge the deaths his parents, while he later recognizes that what a child should do is not to fight on the battlefield like an adult, but to distribute newspapers in the base camp since words can also be employed as a powerful weapon." Red Tassel is probably too heavy a story for today's children. To make the drama a bit more playful and cater it to today's young audiences, the production team decided to add the character of " the big ugly cow", which Er'xiao had taken as a loyal friend. Liao Xianghong is the director of the play. "In addition to the serious plots, we also infused a sense of playfulness into the show, which was mainly conveyed via a big ugly cow that Er'xiao owned. Through Er'xiao's light-hearted interactions with his cow, as well as with his young friends, this play also intends to portray children's playfulness despite a harsh war-ridden reality." According to Liao Xianghong, in order to make the play resonate with its audience, the use of duets and a chorus is another major highlight. And during the performance, the duets and the chorus bring audiences a rich assortment of music, with an emphasis on the ups and downs of the plot development. Feng Li, Vice President of the China National Theatre for Children, is one of the program's planners. "Mr. Liao earlier inspired us to ponder over the format of our performance, like the use of duets and a chorus, which transforms the conventional narrative format into a more poetic and rhythmic one. The tunes composed by Yang Fan preserve familiar elements of the original song, while also bringing out a strong sense of modernity." The production of Red Tassel began at the end of 2014 at the China National Theatre for Children. The stage has been designed to revive many life-like scenes in that war-ridden village, where the main characters lived. Unveiling the cruel nature of wars in front of present-day children may lead them to cherish their peaceful lives more than ever. Meanwhile, director Ma Yanwei digs deeper into the significance of this play. "The play aims at presenting the story through the lenses of responsibility and moral integrity. We are not intending to evoke the memories of national conflicts, but to remind our young generations not to forget all the bitterness and humiliations our nation has endured in the past." Th 90-minute anti-war play will draw the curtains of the ongoing Children's Theatre Festival on August 26th, but audiences can catch it in theatres again this September, during a show season of national art groups in China. The play Red Tassel, or Hong Ying in Chinese, will mark the end of China Children's Theatre Festival, which will have lasted for more than one month.